Acrobat's automatic form generation is atrocious. It inevitably gets almost everything wrong, meaning you have to recreate it by hand. It boggles the mind that it's had the ability to create forms for 20 years now, and still has no way of automatically creating the form from a Word document without a buggy and and half-hearted attempt at auto-detection. You'd think at the very least it would be able to turn Word form elements into PDF form elements, but no. qmail-remove provides a means to easily remove messages from the Qmail queue, but restoring messages is rather more complicated. Here is a quick shell script that will allow messages to be correctly restored, undoing the yank. Customers wishing to use their own router with VDSL2 (FTTC) services in Germany are hampered by the CPE not supporting PPPoE passthrough, as Telekom limits the line to 1 PPPoE session. The CPE therefore needs to be replaced entirely. This article describes how to extract the login information from an O2 Homebox and then configure a Cisco router as a replacement CPE. For my new NAS, I wanted newly-connected USB disks to be automatically mounted and then exported over Samba. Debian's usbmount program is used to handle the mounting, and a couple of scripts handle the Samba export. 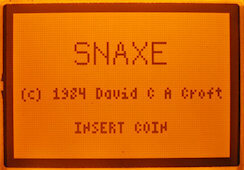 Since I just got my lovely (and cheap) DOGS102 LCD module and an PS2-style thumb joystick, I thought it might be a good first exercise to get Snaxe running on my Teensy. This is a simple multiplayer version of the classic Snake game, developed in 16 hours for the Überall video game party. It features network play, with mobile phone or laptop controllers, for 2-8 players per game. It can also be played with up to 4 players on the local keyboard, or with a combination of both network and local players. I've added one more powerup, 'speed', which doubles your movement rate (effectively letting you get extra moves in between everyone else's moves) for 15 moves. Also finally implemented a smart algorithm to determine how many rabbits to spawn and how often to spawn them and the other powerups. Minimum and maximum rabbit numbers are determined by the number of players in the current game. Added a new skull and crossbones icon besides dead players, keeping their colour (but faded out) so you can quickly see who is dead. Lots of tidying up done today, making the game look a bit better. Katia has started working on new snake images to fit the new board size, but they're not done yet. I've added a new invulnerability powerup, which lets you slither through yourself, other snakes, or bones - but if you're still crossing them when you leave invulnerability, you die. You can still eat friendly powerups in the meantime. You flash faster and faster as your time runs out.